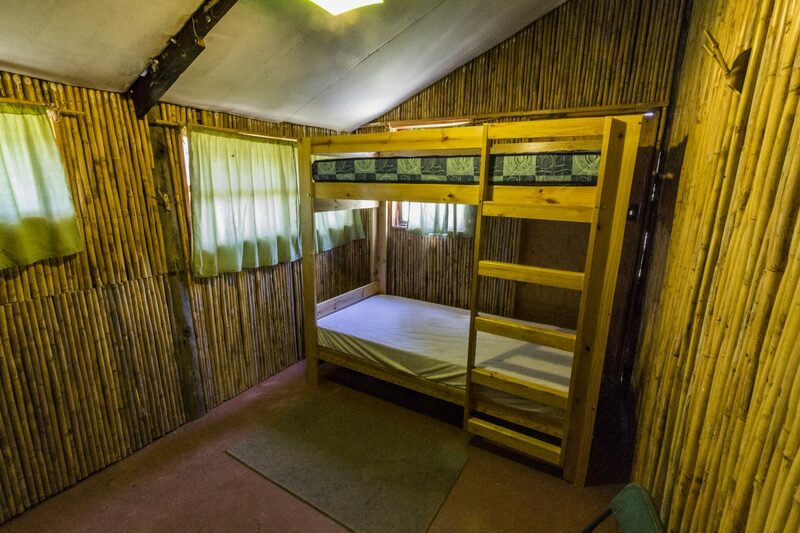 The rondavel (Naguiltjie) is designed as a bed-sitter with one double bed. 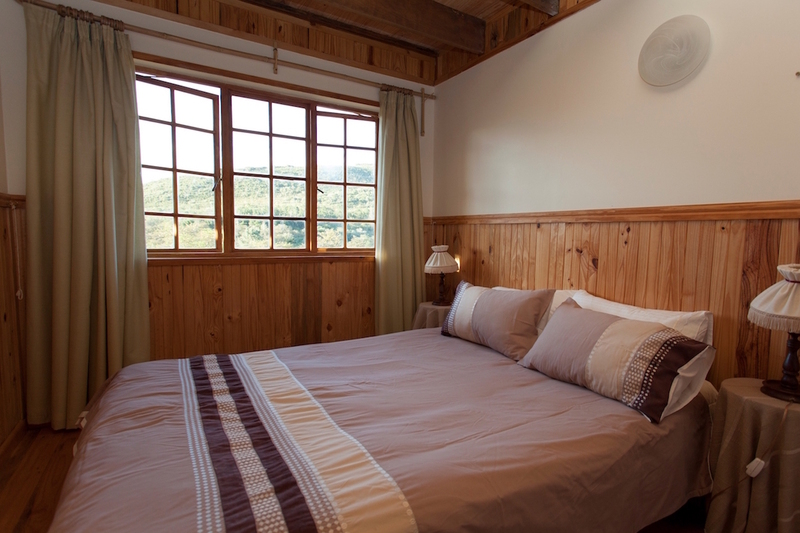 The log cabin (Wielewaal), is a cosy chalet with a stunning view of the valley. 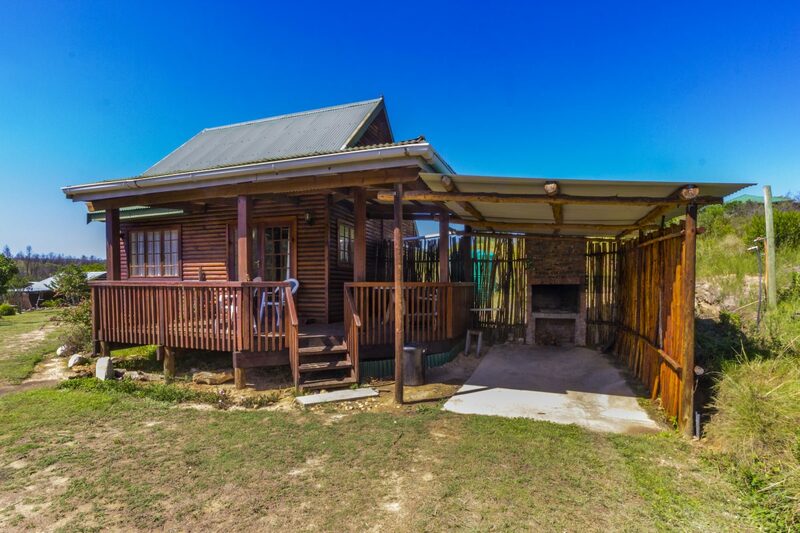 This chalet sleeps four. 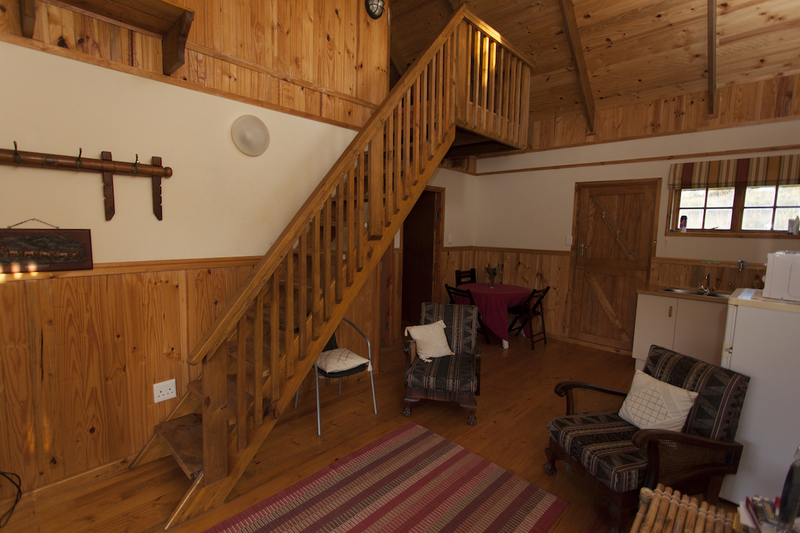 It has a main bedroom with a double bed and a loft with two single beds. 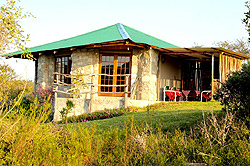 The stone chalet (Kroonarend) is a great family chalet that sleeps six people. 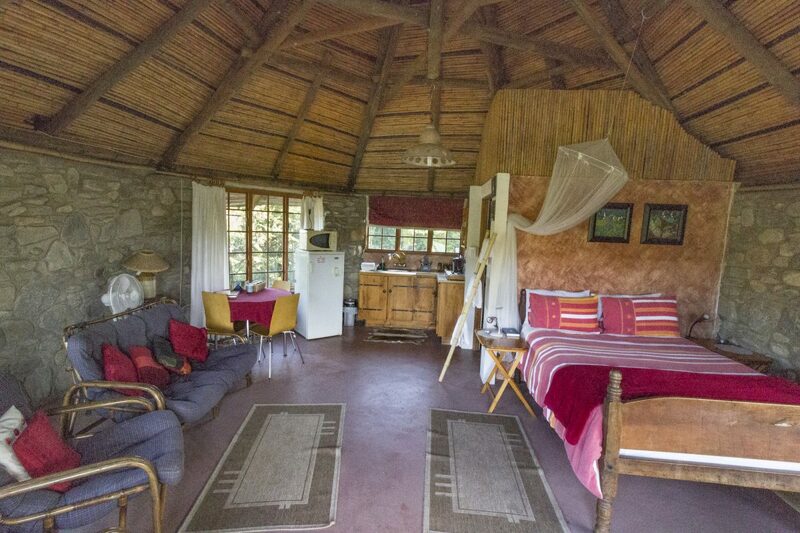 It has a main bedroom with a double bed, and a second bedroom with two single beds. 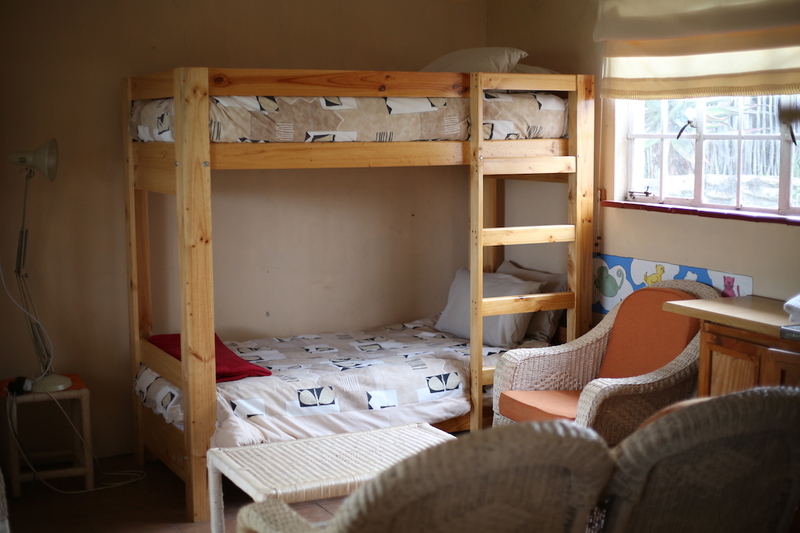 Two additional beds in the living room can also be used. 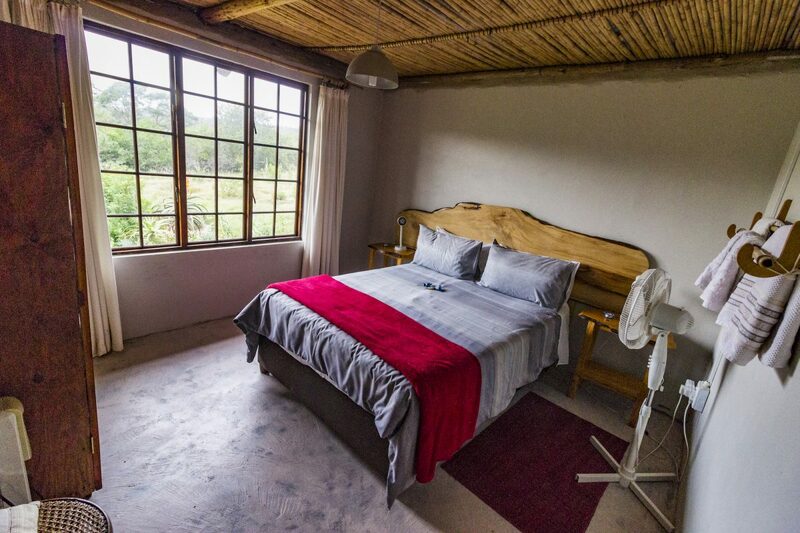 The cottage (Swaeltjie) has two single beds in the main bedroom, (for couples they are put together to form a kingsized bed) There is a bunk bed in the lounge/kitchen. Can sleep four people. 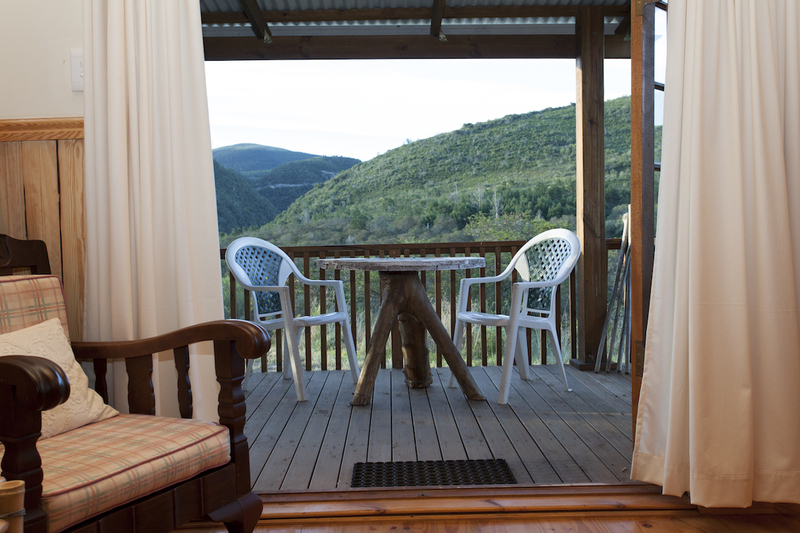 You can use these facilities as your home base to explore the many attractions in the vicinity, or you may just want to enjoy the scenic views from the deck, or go for a hike on the many trails. 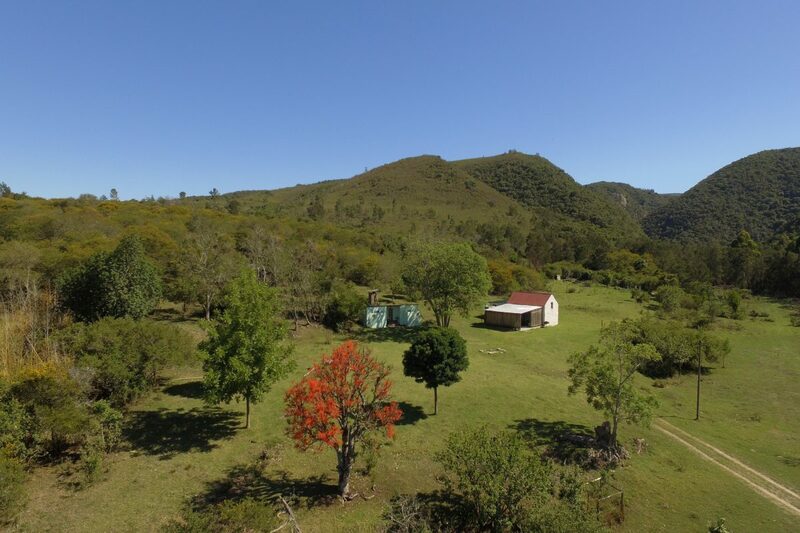 Horseback riding is available nearby at Papiesfontein, 20km on the way to Jeffreys Bay. 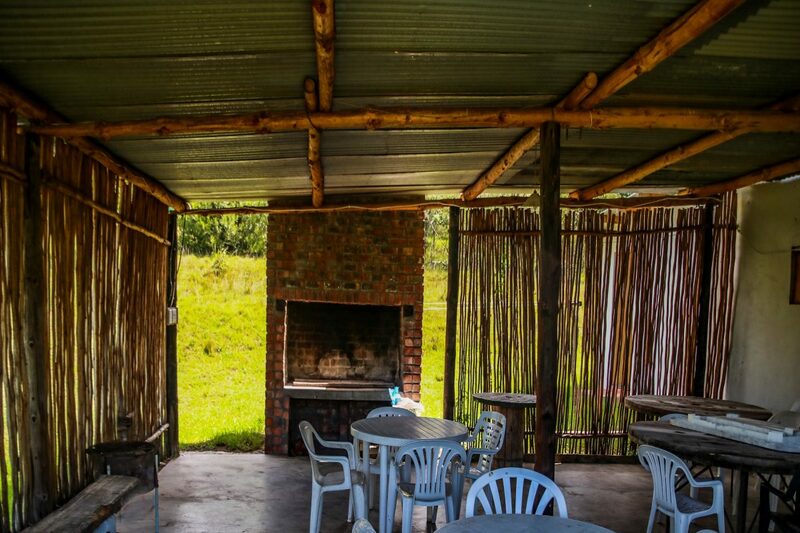 For those who are interested in mountain biking, The JBay Bike Park is only 7km away. 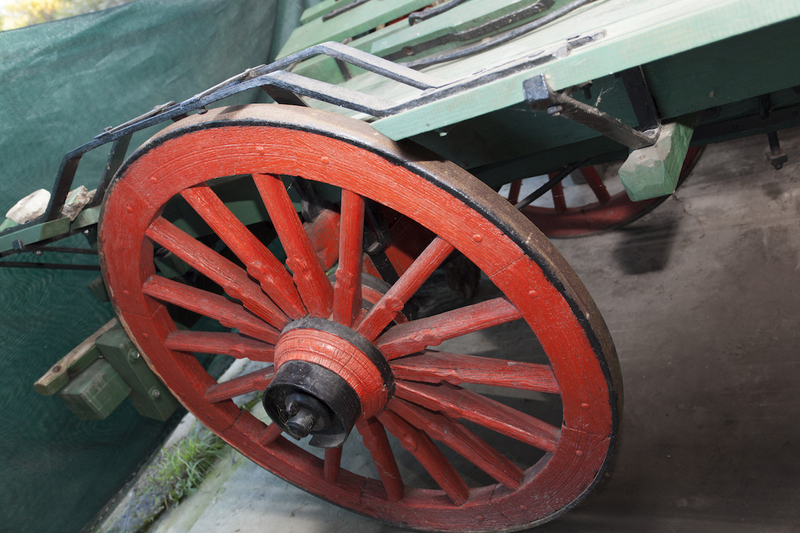 Why not come and enjoy a true pioneer experience in our two restored pioneer wagons? 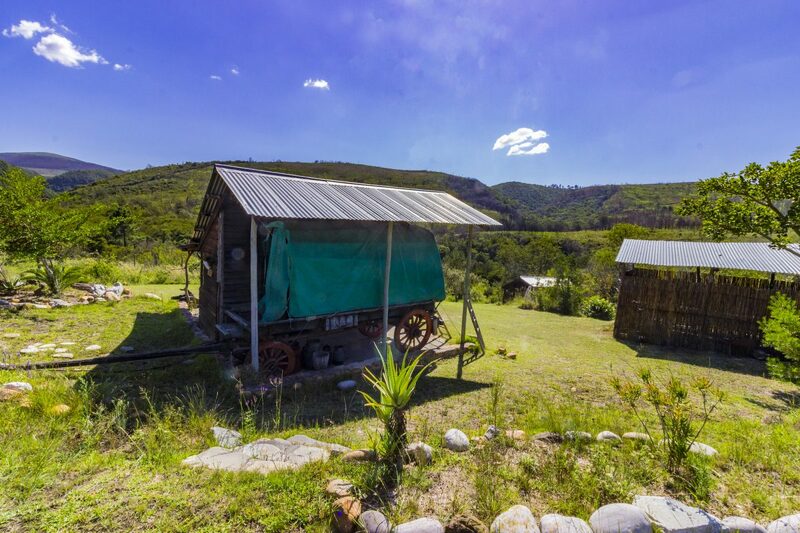 Our pioneer site offers beautiful views of the valleys and hills on the farm. 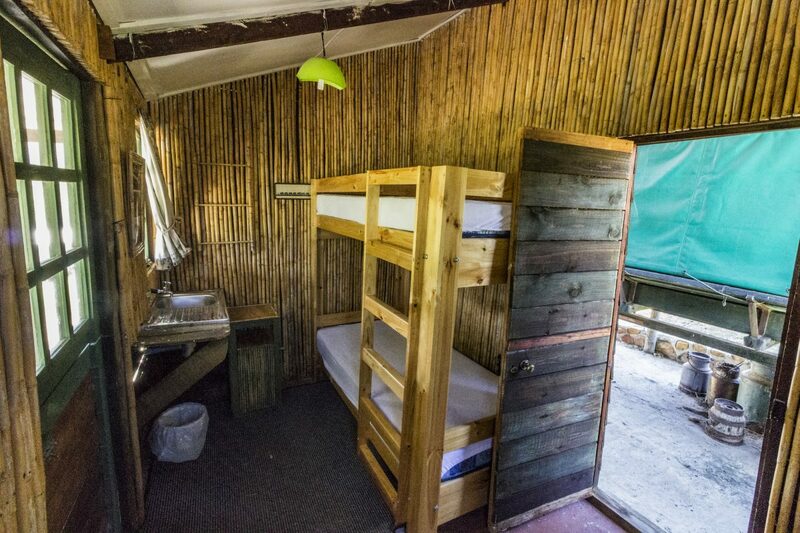 Each wagon (Geelhout and Olienhout) has a double bed, with an adjoining cabin providing sleeping space for two more guests on a bunk bed. 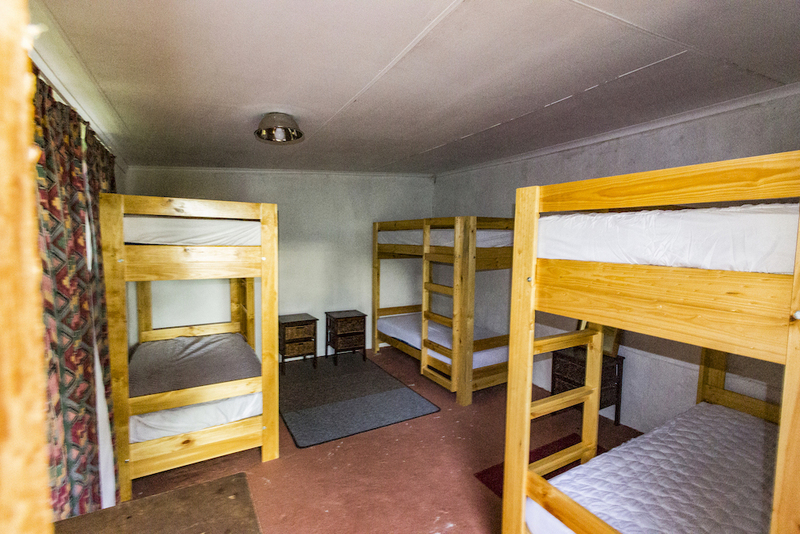 A total of eight guests can be accommodated on the pioneer site. 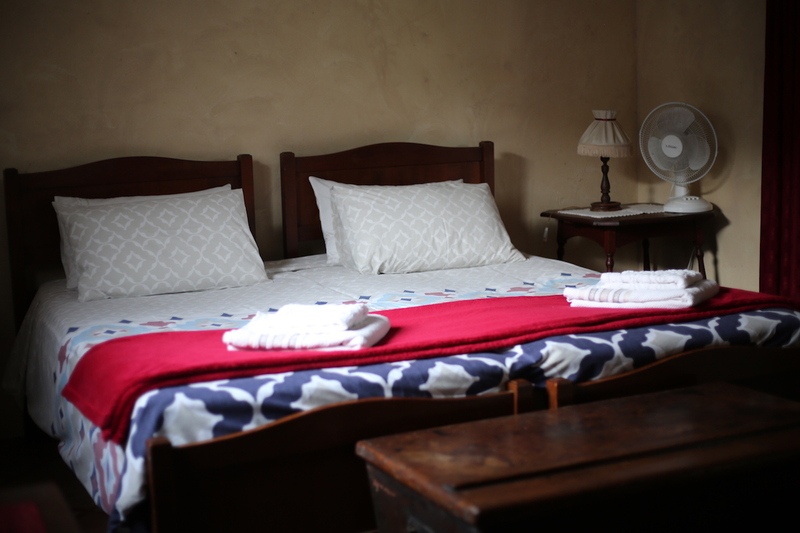 Each adjoining cabin has a toilet and hand basin, however, you need to bring your own linen and towels. There is an outdoor shower with a "donkey" for hot water. 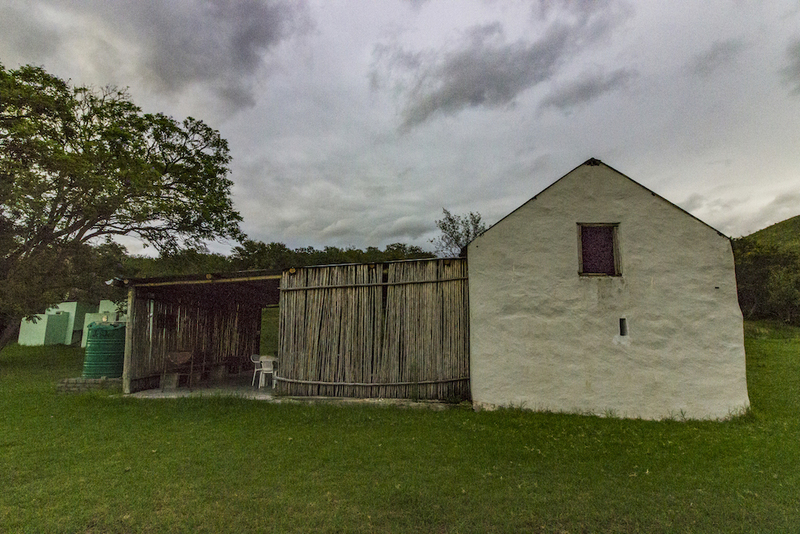 The pioneer site also features a "lapa", or sheltered area, where guests can share their stories around a campfire. There are basic eating and cooking utensils, as well as a basin for washing dishes. 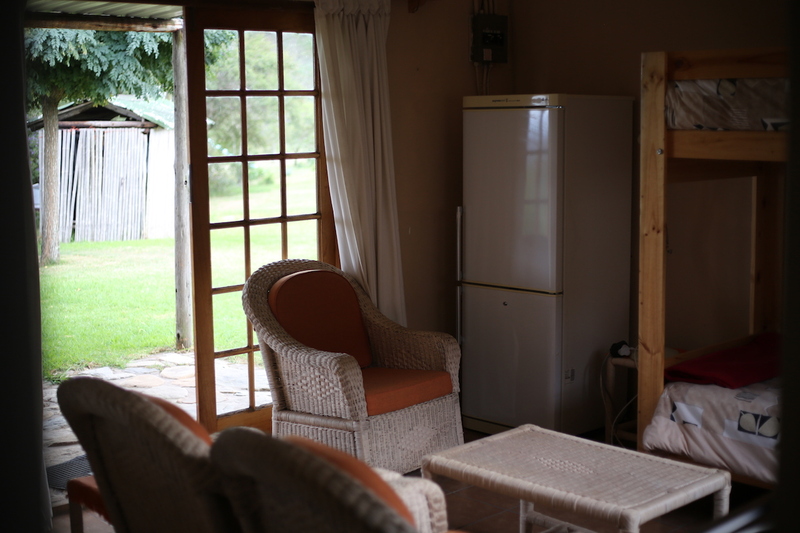 A small gas stove and fridge are also available. 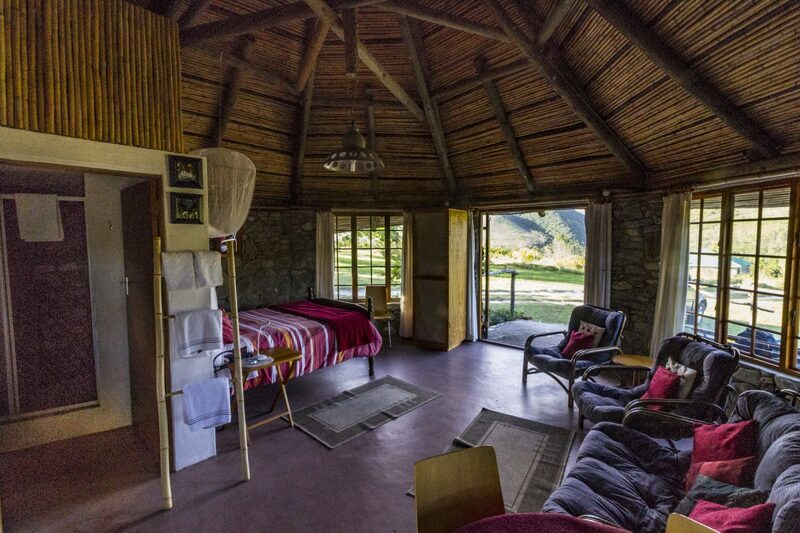 There is electricity in the lapa and the cabins, but it may be helpful to bring a torch along. 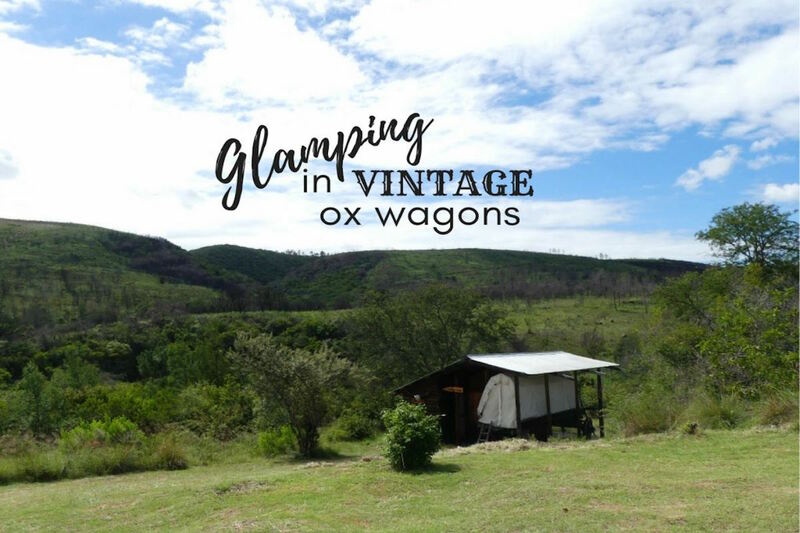 Click here for full post on "Chasing the Rainbow Blog"
Our campsite is situated in a picturesque area of the farm. 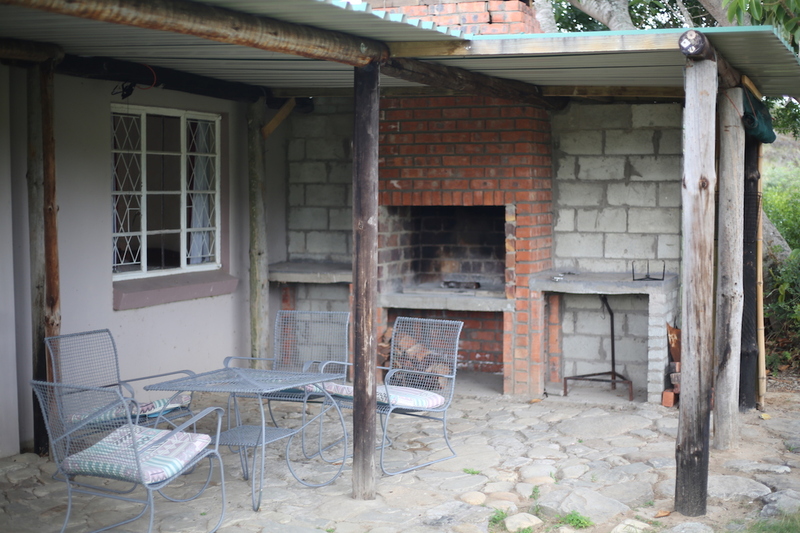 It is on the site where the original farmhouse was built close to the stream. Only tents or off-road caravans can be used, as the road crosses the river at a shallow section which is not accessible to standard/ordinary caravans. It is a favourite pastime amongst campers to hike along the stream to enjoy the beautiful scenery. 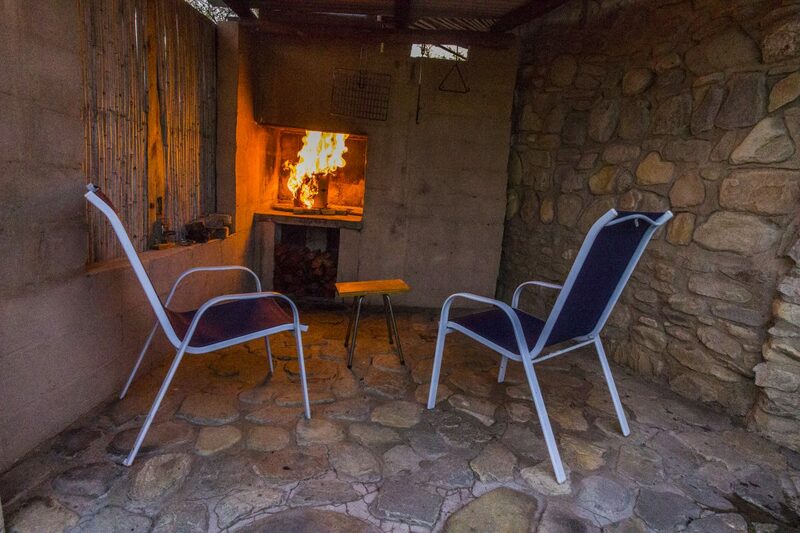 The campsite is also ideal for organised groups. Own tents are to be used. 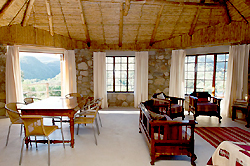 The old barn (lapa) can be used for gatherings and group activities. 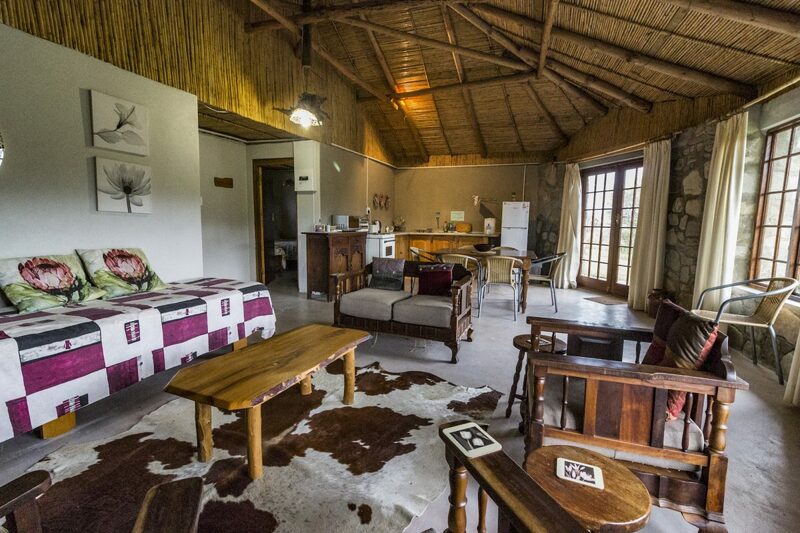 When the whole campsite is booked by a group, a discounted rate is available. 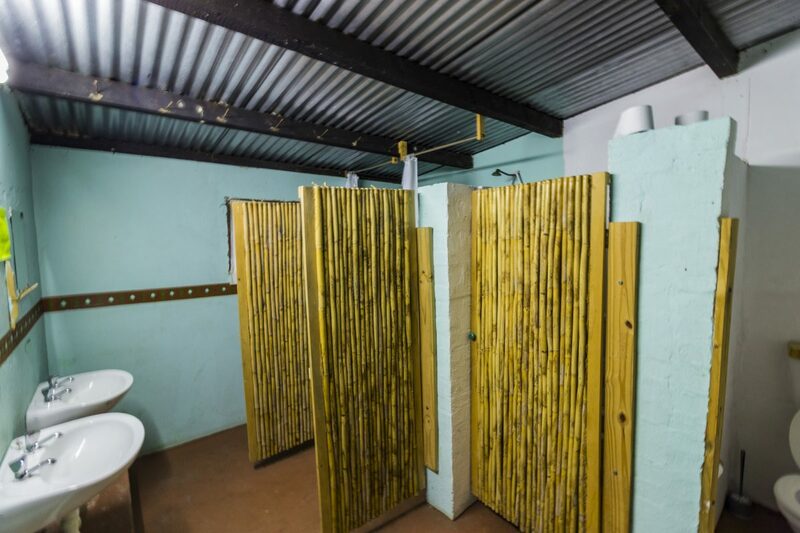 Our clean washroom facilities consist of four toilets, basins and showers. We have electricity in the washrooms, but not at the campsites. 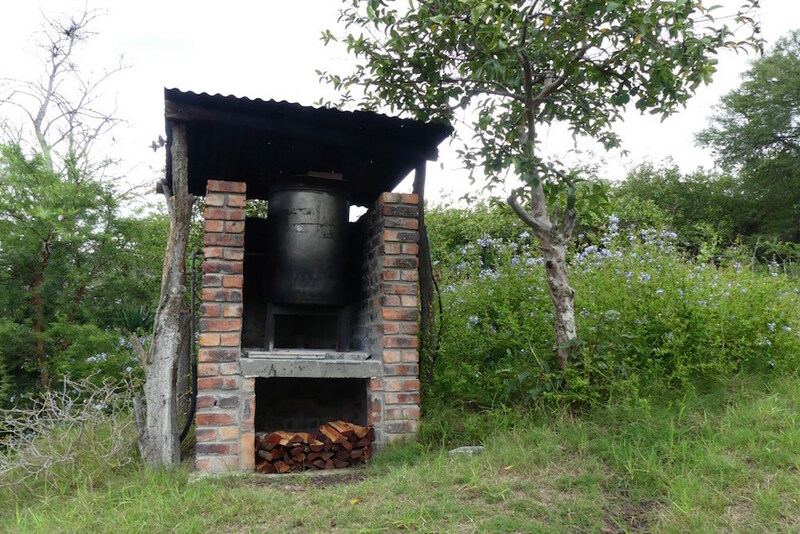 A "donkey" (outdoor water heater) can be fired up to provide hot water for the showers. 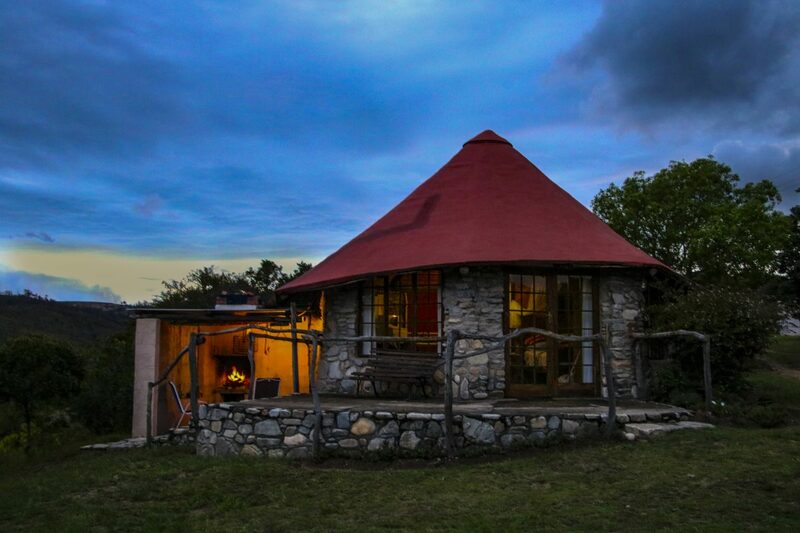 There is a small kitchen with an electrical outlet, a small fridge and a basin for doing the dishes. 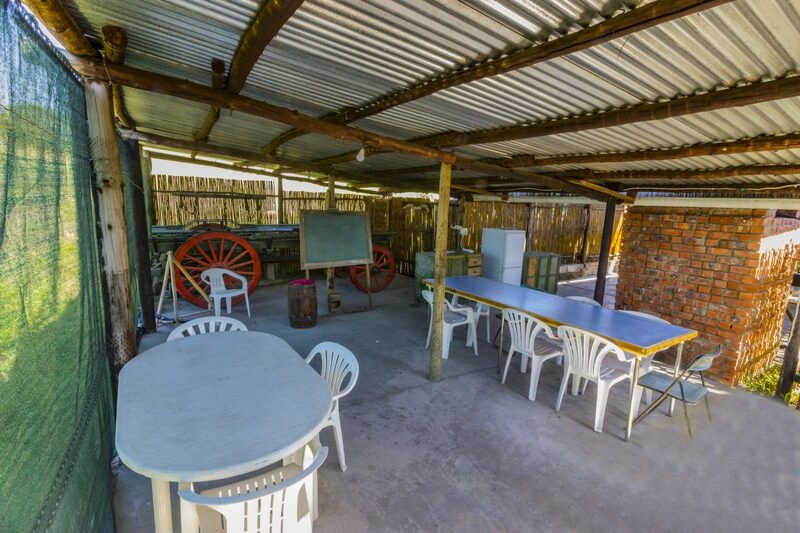 There is also a convenient facility for a BBQ. 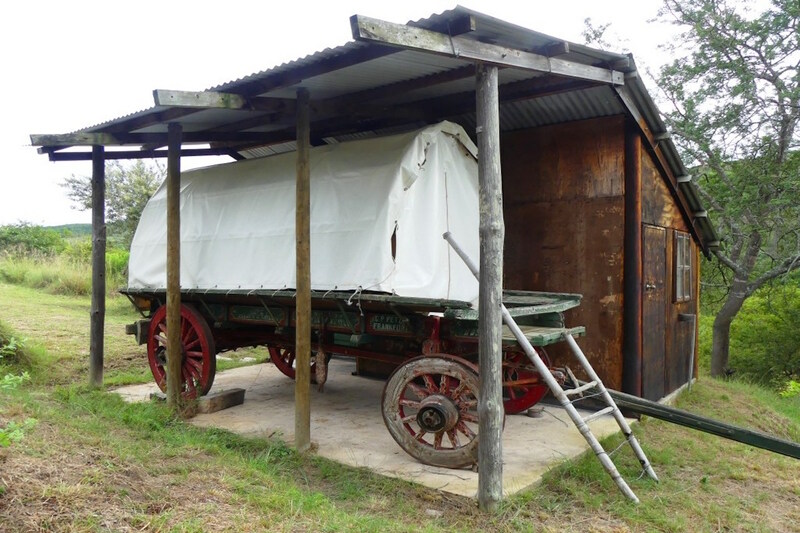 The Smithy, our Backpacker at the camp site sleeps six and the Stable sleeps eight on bunk beds. 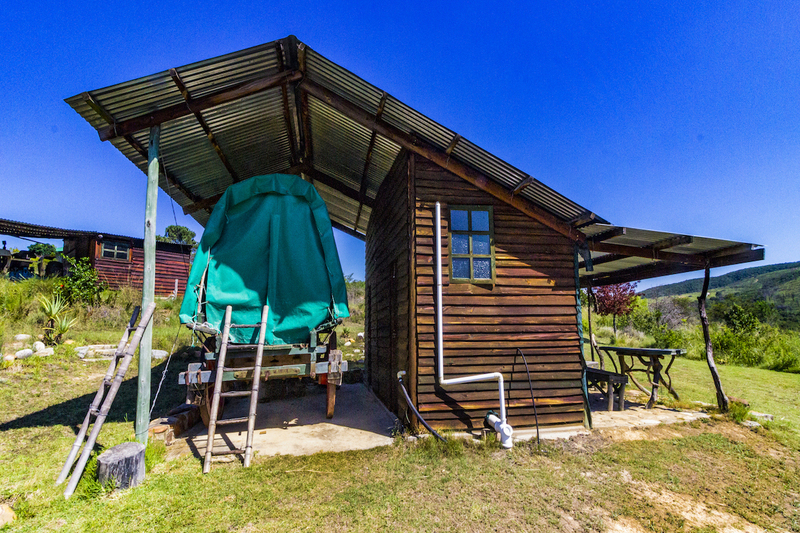 Guests must bring their own bedding and towels and use the ablution facilities of the campsite.